yes i want to make one now!! The curtains "fell down" (or whatever you call it when your children hang on them) and I haven't put them up yet. There is a sheet up right now, but I am soooo tempted to try this! My only problem is being able to see them play outside. I'm going to have to think about this for a while. Oh, that is beautiful! Let us know how long it lasts! O.M.G. This is amazing! My little one is three, and you are inspiring me with every post as the kind of mum I want to be. This is just too beautiful. Love the colours, the shapes, the gorgeous added details. Wow... I mean... WOW!!! That's so amazing! I'm going to keep that idea in mind next time when my kid is older! Its gorgeous! This is such a superb idea! I'm going to squirrel it away and hopefully pull it out on a wet afternoon when my kids are older. It is really beautiful. Sadly as our floods with the window condensation we get we wouldn't be able to do this. I am from UK and I totally remember those glue pens - haven't seen one of those in YEARS!! Absolutely gorgeous. I can't wait till my children are old enough to do this project with them! wow. 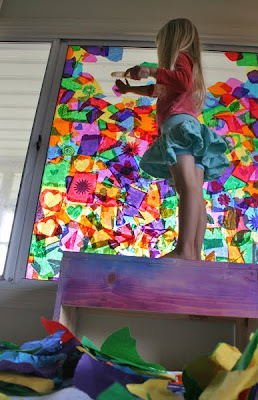 at my preschool I had a giant window that would have been great for this....I think if I do it at home my hubby would kill me....but I may try it anyway....LOVE IT!!! LOVE this! And i grew up in England with that same kind of glue as well! Linked to you in my week in review post today - thanks for the great project! We did this on the bottom half of our back door one summer and it looked great. It was strangely easy to peel off once it started to look manky with condensation and muck. We have those glue pens in the pound shop by us and I prefer them to glues ticks which are always drying out - unless you leave them with the id off in the garden in which case they keep damp! Beautiful art with a place of prominence. What a terrific idea! I So want one of these in our house - the girls would LOVE it. Just need to find the glue pens now. So, so beautiful. My two would love this. We're going to do one on our back storm door. Here's a link to the glue pens on Amazon: http://www.amazon.com/Office-Depot-Glue-Pen-Fl-oz/dp/B003RPLMSY/ref=sr_1_24?ie=UTF8&s=automotive&qid=1276996867&sr=8-24. That looks super fun and awesome! We need a way to block the view from our windows (the dog likes to bark at people), but we like to have the curtains open. This might just be the thing! That is positively beautiful! I really love that they were so into it that the whole window got covered. It's marvelous. I need to get back over there to see it before it falls apart! This is awesome! I can not wait to do this with my girls!!! I wonder if a bingo doter pen could be re-used as a glue doter pen? We'll try ... and let you know. Super Cool Idea!!!! love this idea! my son would love to do it, and it is so cool at night, thanks for sharing! 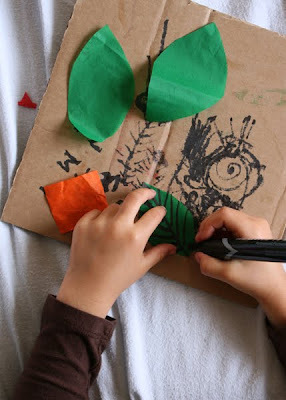 I love the low cost crafts you do with your kids, it is so helpful to us! 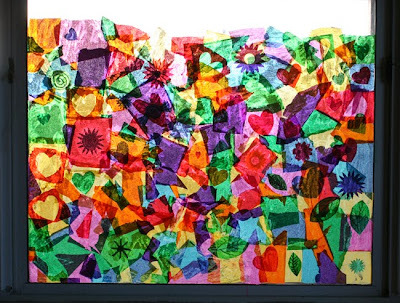 I have indeed seen a lot of tissue paper sun catchers, but this one is by far the most beautiful. I love reading your blog, because your projects are done with a creative twist. That is so beautiful and fabulous! I love how not only you come up with the idea for such a wonderful project, but totally support your girls all the way through to completion. I'm sure that gives them so much confidence...so cool! Oh, I absolutely love it!! Gorgeous!! I think I would want it to last forever though, it's so beautiful! Love it. As soon as I saw this pic I said: "WOW!" I love gorgeous art like that! I remember using those glue pens as a kid too (I'm in Canada) but don't see them around anymore! Again one of these incredible creative projects from you!!! Congratulation to you and your marvellous blog! That is SO fantastic! I want to do one! SPECTACULAR!! This looks so beautiful. What a wonderful time you all had! My children at kinder would love this ... thinking ... thinking ... thinking! This is brilliant! 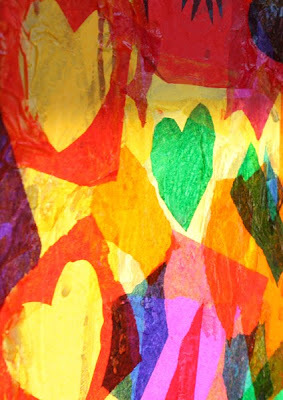 I love the way it looks - the light glowing through the tissue paper, and I love the fact that this is something your children created together! Please let us know how long this lasts, and how it is to clean up! I need to hunt down some of those glue pens. We have several perfect windows at school at the kids will love figuring out how to get all the way to the top. This is so beautiful, it looks just like stained glass! I used those glue pens growing up too, possibly during the years I spent in France? They were so easy to use! I love this so incredibly much. I read it yesterday and today I went and got tissue paper and glue pens. Summer project! Wow, I absolutely love all your projects, you always leave me speechless with your creativity. Thank you so much for sharing! As I think so often when I visit this site - how creative and amazing. You inspire me in my everyday life to take chances and try new things. Thank you for sharing your life with the net. This takes my breath away. How lovely. And although it is appropriate for preschoolers, what kid, of any age, wouldn't get into this. I love the extra touches. I'll be linking on facebook. Thanks for sharing! google "washable glue pen" and the exact same pen shows up from Discount School Supply! This is beautiful, creative, precious, and such a great idea! I say leave it up as long as you can! Makes me wish I had kids to do this to my front window. Or maybe I can just do it myself and tell my husband a band of 5-year-olds broke into our house. Yeah. That's a good plan. A fantastic idea! 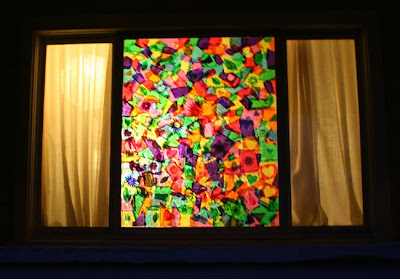 It is a beautiful and colorful window ... is like a window. Does the glue you use is special?? Love it!!! I will be doing this with multiple windows in my house! I'm thinking it could also be changed seasonally...oh, imagining the possibilities!!!!! Yes I want one too, totally gorgeous! 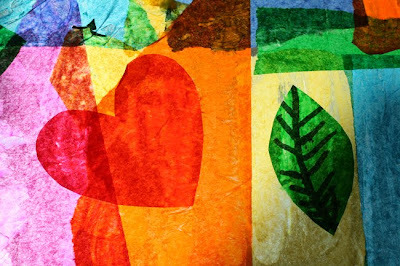 Be sure to tell the kids about darling old Mr. Matisse (find in the book Discovering Great Artists), how he became so ill and bedridden that he could no longer paint;so next, being an insatiable artist, he began to cut paper into wild shapes to make collages. And in fact, stained glass windows were made from his designs. His story is a fascinating one for children. And his art style is one they will love and appreciate. 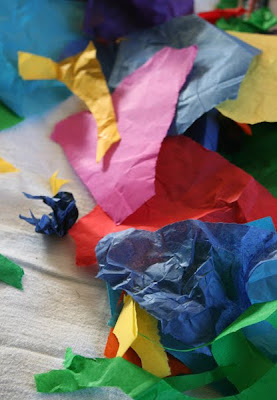 I'd love to post about this tissue paper collage idea- I'd link and just use one photo of the finished project. Please let me know if this is OK.
That would be totally fine Julia. Glad you like their window :) They are really proud of it. It'll be a fun project to do every now and again as they get older. Also, Paula, if there is a word in the English language for "whatever you call it when the curtains fall down because your kids hang on them" then I need to add it to my vocabulary! I'd LOVE LOVE LOVE to see some pics if any of you try this project. I know Tom is in the middle of it with his tribe and I can't wait to see the results! We MADE ONE! was easy and awesome. Thanks for all the great ideas! 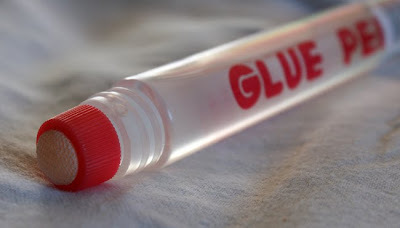 I remember these glue pens from grade school here in the USA. 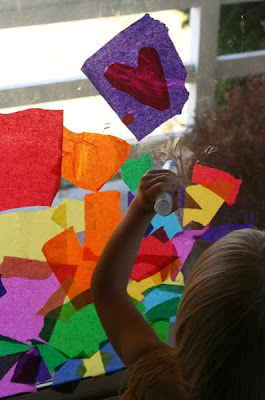 I will be keeping an eye out for them during school-supply season so my boys can try this on our glass storm door. Love this idea, and you post such gorgeous pictures. Thanks! Wow, that's stunning! I would love to do this in the window portion of my back door. Thanks so much for the idea, I'll be linking. This is so awesome! What a wonderful idea. Love it! so would any clear glue work? 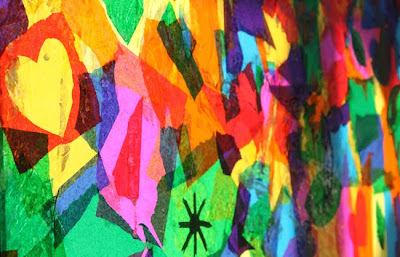 Like Elmer's school glue or mod Podge? I really want to try this for my back window and my kids would have a blast with this. If you don't already have one, you should get a book contract. Your projects are consistently better than what I see in kid magazines and craft project books. I like that they are low cost and don't require a lot of prep work. wow, so great, and so glad you're showing us not to be afraid of glueing things on windows! I'm going to link to this on my weekly linking party at creativejewishmom.com so I can share it with my readers. Thanks so much! Loved it, did it, photo'd it, linking back to you, lovely lady! Thank you and namaste. This is utterly gorgeous, sheer genius really. 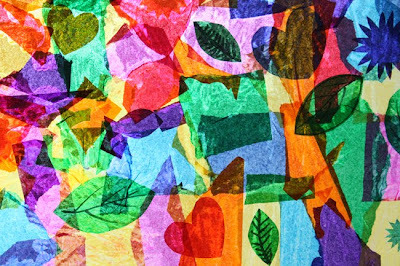 I just love this and what a fabulous way to get your kids excited about art! Thank you for this beautiful idea! We are I'm the midst of our NZ winter school hols and really need cheering up; this project will be perfect!!!! Now I am wandering round my house looking for the perfect window to do this on! Beautiful!!! I think we will try that too. Thanks for the super fun idea!! Here is a link to some water soluable glue pens online...I will be putting in an order! @Paula = could you have your kids do the bottom of the window - perhaps 2/3 up so you could see them AND have privacy and some color??? 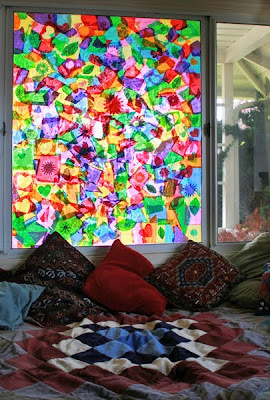 I LOVE this and am going out to get tissue and glue to do this in my art room window - it's P E R F E C T!!! This is so beautiful! I love the colours on the window. Can you please tell me if Micheals or Jo-Ann would carry the sheets? This is gorgeous. We have done versions of this art project many time, but nothing on this scale. I love it! I would want to keep it up too! I am SO going to CVS to look for those glue pens! Thanks for the wonderful idea. wow. I've just spent 2 hours reading your blog. my little girl is almost 2 and I'm always on the look out for inspired things for now and the future. I used again your great idea to make birthday wishing cards. Oh my gosh, I love this! Absolutely beautiful! I just had to write and let you know we tried this and it turned out fantastic! I couldn't find those glue pens so I substituted blue Elmer's school gel and a foam brush. We started with a heart shape for Valentine's Day and now we're expanding it to cover the entire back door. We have south eastern exposure and having breakfast with the sun pouring in over the colors is GORGEOUS! LOVE your ideas, keep 'em coming! OH my gosh! This is one of the BEST things I've ever seen! It's beautiful and I LOVE, LOVE, LOVE, that it looks like it's in a main room of your house. I'd keep it on my windows as long as possible too - I bet when the sun hits it full on it's simply stunning! I love this one!! Well your whole blog! We will do this in school for summertime to make some shadow! 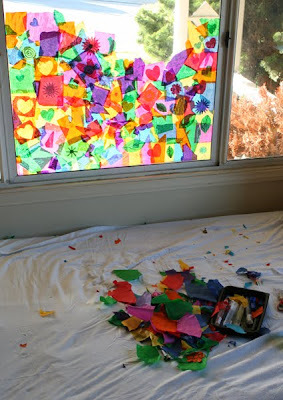 Are you okay with my pining this on the new site http://pinterest.com/ I LOVE the tissue paper glue window collage and this is a site that let's me collect ideas to try later. Have you seen the latest issue of Family Fun? They copied your idea! It's unfortunate they didn't contact you and give you credit, but at the same time how cool! Now even more people will know about your idea and put it into action! Thank you! You have solved my window privacy dilemma! 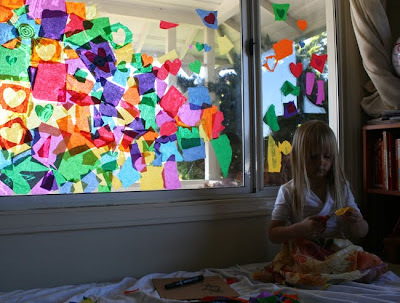 Its a fantastic idea, but instead of gluing them directly on the window i'm going to get non adhesive transparent window clings as a base. THANKS AGAIN! 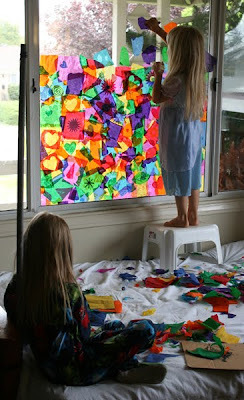 We are renting right now and would not want to permanently ruin the window but my daughter would love this! How easily does the glue come off when it's time to take it down? This is absolutely perfect! Thank you so much for the inspiration! I can't wait to try this with my daughter, and friends, when she is a bit older. Wonderful! I've been trying to come up with a treatment for some of my windows. 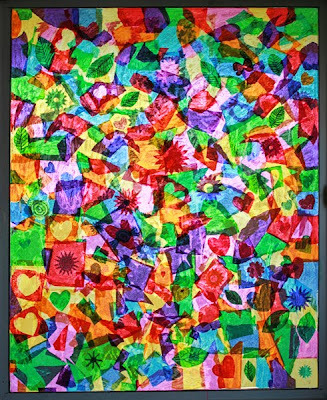 I was doing tissue and liquid starch collages with my preschool class, and wondered if it could be done on glass. 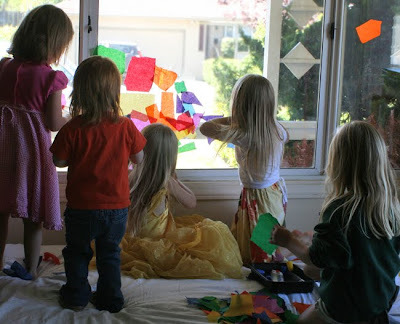 I googled tissue paper on windows and your beautiful project came up. Now I know how to do it! Thank you so much for sharing it. You and your girls are very talented and creative. I would love to do this in my classroom of first and second graders. I am worried about harming the window in my school. Does the window really come clean easily? Making sure. So beautiful! Found this through interest. it's absolutely gorgeous! I love this!! I have a bathroom window that this would be SO perfect on!! And you are right - I do want to go and do this right now!! You are right - I want to go do this now!! I have a bathroom window that this would be perfect for AND I have a bunch of little friends that would love to help!! A very nice article thank you!!! These glue pens are common in Pakistan and with summer coming up fast, I think it will be a good idea to let the children (plus the hidden one inside their parents) their creativity! 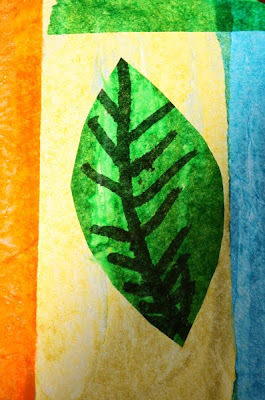 Thank you for sharing another interesting craft project that the kids will surely love! This is proof that we can indeed make something out of used or old materials and not just buy new materials when we want to make a collage. 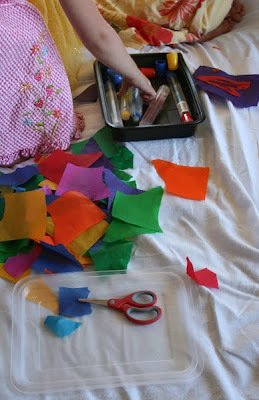 The use of tissue paper is practical and shows resourcefulness. 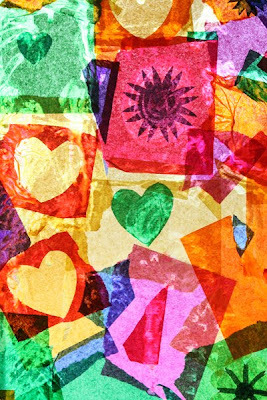 Our old paper documents, newspapers or plastic items can also serve a variety of purposes aside from turning them into pieces of craft art. Thanks for sharing! I am 22 years old, male, and I AM GOING TO DO THIS TOMORROW. Thanks for the idea! Your blog is terrific! My four year old granddaughter and I started cutting and tearing shapes this morning to do this project. Our lively schnauzer drives me absolutely nuts yapping out the windows every time she sees a squirell or bird or leaf or cat - or anything at all out the window. For a year now I've had press & seal on the lower section of the windows to keep her from seeing out. It has curbed the yapping, but our windows look horrid from utside. (I can't see the plastic wrap from inside since it's behind the curtain. 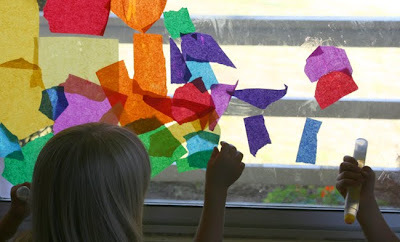 But I am now excited to think of something beautiful that the children make to cover the window. I am planning to leave about a foot at the top open so I can see out the window, but will put valance length sheers up there. It will still let in light, but I can see out too. What a great project! Thanks for posting it. I found it when googling easy stain glass window projects. My kids have a huge picture window in their room that they can't seem to keep a curtain up in so I am imagining this as a solution to that! Thanks so much for the idea! Sorry to see it go but glad it came down so easily when you needed to move. Have a wonderful move back to Wales! What great inspiration!!! I am thrilled to start this project. I couldn't find any glue pens so we're going to try watered down school glue... Thank you for sharing. This is such an inspiration! I wasn't able to find glue pens so we're going to try it with watered down school glue. Can't wait to see what ours turns into!!! Thank you for sharing!!!!! This is awesome! I think I'm going to do it around my windows at school - liked a 4 inch frame so we can still see out but have the beautiful colors too! If I feel mighty inspired I might but out letters to use to make the boarder (using my cricut machine or the ellison machine at school).... Is yours still up two years later? And if so, how much has it faded? Love this! Can also completely cover the window first with a layer of plastic food wrap. Then you can glue to the wrap, even using regular glue sticks. Whole thing will peel off easily when you're ready for a change. How long did it last before fading?